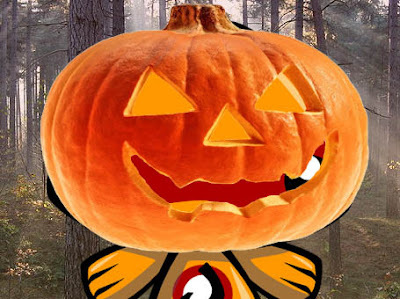 KawaiiPunk - Kawaii Mascot Blog: Halloween Hullabaloo! Pumpkin Mascot? Yip, that’s right, we stick that aforementioned pumpkin on someone’s head! But wait! It looks like the eye holes in this particular pumpkin are in the wrong place for this mascot’s head! What a disaster! I guess this mascot is just going to have to find himself another pumpkin to complete his Halloween costume! So the question is… can you work out which mascot is under the ill fitting pumpkin before he takes it off? Well, can you? Find out if you can when the answer is revealed in this month’s monthly round-up! New Creeps on the Block!